On the day after the Offspring's bloated, uninspired performance, it was refreshing to see a band trending in decidedly different directions -- namely, Montreal's Honheehonhee. Performing to a rain-soaked Sunday evening audience -- some of whom were in a testy mood after Mastodon's forced set cancellation -- the band's brand of hyper-caffeinated, gleefully oddball indie pop proved an excellent antidote to the fest's gloomy closing day. Led by the falsetto of vocalist Greg Halpin -- whose mega beard felt more Akron/Family than Montreal indie pop -- the band were at their sloppy, irreverent finest, performing tracks from their high-octane debut LP, Shouts. And shout they did, with each member piling on layers of scream-shouted vocals, an effect that part resembled a deranged Thee Oh Sees and part Spencer Krug on whippets. 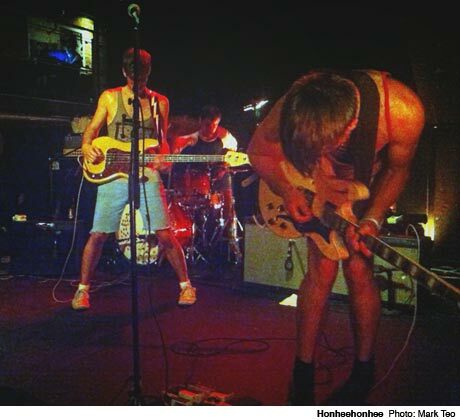 By the time Honheehonhee reached their closer, the infectious "We Only Go," the band were disheveled, impossibly sweaty and half-clothed -- and had the audience singing along to songs they hadn't previously heard. And if that's not a sign of an excellent performance, we don't know what is. Bonus points go to bassist Matt Raudsepp's pirate doo rag and keyboardist Erin Halpin's uninhibited bedroom dancing.